The ratio should be a minimum of 7:1, water to tapioca pearls. Add in the tapioca pearls to boiling water. The tapioca pearls should float in the water. *This is not recommended for bubble tea shops. Put all ingredients except tapioca into shaker and shake it up. Make sure that the flavor powder and creamer is mixed well. Add bubble tea tapioca pearls to a cup, and pour your drink over. *Add more flavor powder and creamer for thicker drink. The best tasting fresh fruit drinks include strawberry, watermelon, mango, red bean (adzuki), and papaya. Put all ingredients except bubble tea tapioca pearls into a blender and blend well. Make sure that the fruits are grinded into the milkshake. 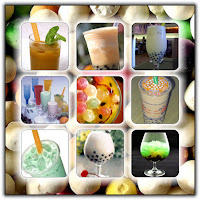 Put bubble tea flavor powder, creamer sugar syrup and fresh fruit into the blender for 20 seconds or until blended well. Blend the drink less if you like little pieces of fruit. *A much easier option is to use our Bubble Tea Milk Tea Powder. Heat the water to boiling, then using four layers of cheesecloth as a filter, pour the water through the tea four times or until the tea until reaches the right color. Mix together the Thai tea, bubble tea sugar syrup and sweetened condensed milk and shake until little bubbles form on the top of the drink. Add bubble tea tapioca pearls to a 16 oz. cup, and pour your drink over. Put coffee, creamer, and bubble tea sugar syrup in a shaker and mix well.